Kathryn Dawn Lang OC AOE (born November 2, 1961), known by her stage name K.D. Lang (stylized in all-lowercase as k.d. lang), is a Canadian pop and country singer-songwriter and occasional actress. Lang has won both Juno Awards and Grammy Awards for her musical performances; hits include "Constant Craving" and "Miss Chatelaine". She has contributed songs to movie soundtracks and has collaborated with musicians such as Roy Orbison, Tony Bennett, Elton John, Anne Murray, Ann Wilson, and Jane Siberry. Lang is also known for being an animal rights, gay rights, and Tibetan human rights activist. She is a tantric practitioner of the old school of Tibetan Buddhism. She performed Leonard Cohen's "Hallelujah" live at the opening ceremony of the 2010 Winter Olympics in Vancouver, British Columbia. Previously, she had performed at the closing ceremony of the 1988 Winter Olympics in Calgary, Alberta. Lang possesses the vocal range of a mezzo-soprano. Lang was born in Edmonton, Alberta, the daughter of Audrey Bebee and Adam Frederick Lang. She is of English, Irish, Scottish, German, Russian-Jewish, Icelandic, and Sioux ancestry. When Lang was nine months old, her family moved to Consort, Alberta, where she grew up with two sisters and one brother on the Canadian prairie. Her father, a drugstore owner, left the family when she was twelve. After secondary school, Lang attended Red Deer College, where she became fascinated with the life and music of Patsy Cline and decided to pursue a career as a professional singer. She moved to Edmonton after her graduation in 1982 and formed a Patsy Cline tribute band called the Reclines in 1983. She and the Reclines recorded a debut album, Friday Dance Promenade, at Sundown Recorders. Label owner Larry Wanagas became her personal manager. The first band featured Stu Macdougal on keys, Dave Bjarnson on drums, Gary Koligar on guitar and bassist Farley Scott. The Reclines regularly played Edmonton's popular Sidetrack Cafe, a local venue that featured live bands six nights a week. In 1983, Lang presented a performance-art piece, a seven-hour re-enactment of the transplantation of an artificial heart for Barney Clark, a retired American dentist. A Truly Western Experience was released in 1984 and received strong reviews and led to national attention in Canada. In August 1984, Lang was one of three Canadian artists to be selected to perform at the World Science Fair in Tsukuba, Japan (along with other performing and recording contracts throughout Japan). Singing at country and western venues in Canada, Lang began to establish an appearance and style referred to as "cowboy punk". She would later recall the inspiration for her defining look in an interview with The Canadian Press: "I used to sew plastic cowboys and Indians on my clothes - just having fun with it on a budget. I was broke at the time, so I'd find things at Value Village or get my mom to make me a skirt from the curtains she was about to throw out. I loved playing with the clothes as much as the music." Lang made several recordings that received very positive reviews and earned a 1985 Juno Award for Most Promising Female Vocalist. She accepted the award wearing a wedding dress borrowed from her male roommate at the time. She also made numerous tongue-in-cheek promises about what she would and would not do in the future, thus fulfilling the title of 'Most Promising'. She has won a total of eight Juno Awards. In 1986, Lang signed a contract with an American record producer in Nashville, Tennessee, and received critical acclaim for her 1987 album, Angel with a Lariat, which was produced by Dave Edmunds. Lang first earned international recognition in 1988 when she performed as "The Alberta Rose" at the closing ceremonies of the Winter Olympics. Canadian women's magazine Chatelaine selected Lang as its "Woman of the Year" in 1988. Lang's career received a huge boost when Roy Orbison chose her to record a duet of his standard, "Crying", a collaboration that won them the Grammy Award for Best Country Collaboration with Vocals in 1989. The song was used in the Jon Cryer film Hiding Out released in 1987. Due to the success of the song, Lang received the Entertainer of the Year award from the Canadian Country Music Association. Lang would win the same award for the next three years, in addition to two Female Vocalist of the Year awards in 1988 and 1989. 1988 marked the release of Shadowland, an album of torch country produced by Owen Bradley. In late 1988, Shadowland was named Album of the Year by the Canadian Country Music Association. That year she also performed "Turn Me Round" at the closing ceremonies of the XV Winter Olympics in Calgary, Alberta, and sang background vocals with Jennifer Warnes and Bonnie Raitt for Orbison's acclaimed television special, Roy Orbison and Friends, A Black and White Night. In 1990, Lang contributed the song "So in Love" to the Cole Porter tribute album Red Hot + Blue produced by the Red Hot Organization. In 1998, she contributed "Fado Hilário" to the AIDS benefit compilation album Onda Sonora: Red Hot + Lisbon produced by the same organization. Lang won the Grammy Award for Best Female Country Vocal Performance for her 1989 album Absolute Torch and Twang. The single "Full Moon Full of Love" that stemmed from that album became a modest hit in the United States in the middle of 1989 and a Number 1 hit on the RPM Country chart in Canada. In 1989, she sang a duet, "Sin City", with Dwight Yoakam on his album Just Lookin' for a Hit. The 1992 album, Ingénue, a set of adult-oriented pop songs that showed comparatively little country influence, contained her most popular song, "Constant Craving". That song brought her multi-million sales, much critical acclaim, and the Grammy Award for Best Female Pop Vocal Performance. Another top ten single from the record was "Miss Chatelaine". The salsa-inspired track was ironic; Chatelaine, a women's magazine, once chose Lang as its "Woman of the Year", and the song's video depicted Lang in an exaggeratedly feminine manner, surrounded by bright pastel colors and a profusion of bubbles reminiscent of a performance on the Lawrence Welk show. She received a writing credit for the Rolling Stones 1997 song, "Anybody Seen My Baby? ", whose chorus sounds similar to "Constant Craving". Jagger and Richards claimed to have never heard the song before and when they discovered the similarity prior to the song's release, were flummoxed as to how the songs could be so similar. Jagger discovered his daughter listening to a recording of "Constant Craving" on her stereo and realized he had heard the song before many times but only subliminally. The two gave Lang credit, along with her co-writer Ben Mink, to avoid any possible lawsuits. Afterwards, Lang said she was "completely honoured and flattered" to receive the songwriting credit. She contributed much of the music towards Gus Van Sant's soundtrack of the film Even Cowgirls Get the Blues, and also did a cover of "Skylark" for the 1997 film adaptation of Midnight in the Garden of Good and Evil. She performed "Surrender" for the closing titles of the James Bond film Tomorrow Never Dies, having previously worked with Bond composer David Arnold on his album Shaken and Stirred: The David Arnold James Bond Project. In 1996, she was made an Officer of the Order of Canada. In 1997, Drag, an album of cover tunes dedicated to 'smoke' (specifically cigarette smoking) was released. The album cover and booklet photographs show Lang in a man's suit, referring to cross-dressing as another possible meaning of the word 'drag'. The songs on Drag include "Smoke Dreams", from the '40s, Steve Miller Band's "The Joker", "Smoke Rings", the theme from the cult film Valley of the Dolls, and eight other smoke-themed songs. In 1998, she was inducted into the Canadian Lesbian and Gay Archives' National Portrait Collection. In 1999, Lang ranked No. 33 on VH-1's 100 Greatest Women in Rock & Roll, and she ranked No. 26 on CMT's 40 Greatest Women in Country Music in 2002, one of eight women to make both lists. In 2003, she won her fourth Grammy Award, for Best Traditional Pop Vocal Album for her collaboration with Tony Bennett on A Wonderful World. In 2004, Stephen Holden of The New York Times wrote: "Few singers command such perfection of pitch. Her voice, at once beautiful and unadorned and softened with a veil of smoke, invariably hits the middle of a note and remains there. She discreetly flaunted her technique, drawing out notes and shading them from sustained cries into softer, vibrato-laden murmurs. She balanced her commitment to the material with humor, projecting a twinkling merriment behind it all." In the same year, Lang released Hymns of the 49th Parallel, which featured cover versions of songs by iconic English-speaking Canadian singer-songwriters: Bruce Cockburn, Leonard Cohen, Joni Mitchell, Ron Sexsmith, Jane Siberry, and Neil Young. According to the Canadian Record Industry Association (CRIA), in April 2006, the album went platinum in Canada selling over 100,000 copies. In December 2007, the album reached double platinum status in Australia selling over 140,000 copies. Also in 2004, she sang the song "Little Patch of Heaven" for the Disney film Home on the Range. On July 29, 2006, Lang performed her hit "Constant Craving" at the opening ceremonies of the Outgames held in Montreal, Quebec, Canada. In 2006, she paired with singer Madeleine Peyroux on a cover of the Joni Mitchell song, "River", for Peyroux's album, Half the Perfect World. That same year Lang was featured in Nellie McKay's second album, Pretty Little Head, singing with McKay in "We Had it Right". As well, Lang sang a version of The Beatles' "Golden Slumbers" for the Happy Feet film soundtrack. She also sang a duet with Ann Wilson on the Heart singer's solo album Hope & Glory covering the Lucinda Williams song "Jackson". In 2007, she teamed up with one of her childhood idols, Anne Murray, on a remake of Anne's hit, "A Love Song", that was featured on Anne's album Friends And Legends. On February 5, 2008, she released an album of new material entitled Watershed. It was her first collection of original material since the release of her 2000 album Invincible Summer. An article in which Lang is interviewed states that "when she isn't working, [Lang] is mostly a homebody, living quietly with a girlfriend she refers to as 'my wife' — they are not legally married — and her two dogs." On November 11, 2009, she entered into a domestic partnership with Jamie Price whom she had met in 2003. After separating on September 6, 2011, Lang filed for a dissolution of the partnership in Los Angeles County Superior Court in Los Angeles, California, on December 30, 2011. Lang's first complete greatest-hits collection was released on February 2, 2010, on the Nonesuch label as Recollection. In 2010, she was in Nashville, working on a new album, titled Sing it Loud. The Nonesuch album was released by Lang and the Siss Boom Bang in a spring 2011 release. The band toured North America in summer 2011. In 2012, she moved from Los Angeles to Portland, Oregon. On April 21, 2013, during the 2013 Juno Awards, Lang was formally inducted into the Canadian Music Hall of Fame. She is notable for praising Canadians and "letting your freak flags fly" during her acceptance speech. In 2016, Lang collaborated with Neko Case and Laura Veirs on the album project case/lang/veirs. She participated in the Leonard Cohen memorial celebration "Tower Of Song" in Quebec in November 2017, performing "Hallelujah". Lang performed several times on The Super Dave Osborne Show starting in 1987. In 1988 k.d. lang and The Reclines appeared on Austin City Limits. Lang played the lead in the 1991 drama film Salmonberries, and also co-starred with Ewan McGregor and Ashley Judd in Eye of the Beholder (1999). She appeared as Dita Tommey in the 1997 miniseries, The Last Don. She had an uncredited role as a lounge singer, performing the song "Love for Sale", in 2006's The Black Dahlia. She has also made guest appearances on the sitcoms The Larry Sanders Show, Dharma & Greg, and the famous coming out episode of Ellen. She appeared on the Christmas special of Pee Wee's Playhouse, where she performed the song "Jingle Bell Rock". She also made a guest appearance on the "Garbage" episode of The Jim Henson Hour, and in 2008 appeared on Rove McManus' live hour show Rove. Lang performed with the BBC Concert Orchestra for an intimate crowd at 18th-century church LSO St Luke's in London on February 3, 2008. First aired as part of the BBC Four Sessions, the concert was released as a DVD entitled Live in London in 2009. On February 12, 2010, she performed Leonard Cohen's "Hallelujah" at the Olympics Opening Ceremony in Vancouver, British Columbia. In early May 2010, Lang filled in at the last minute for Susan Boyle at the Australian TV Logie Awards to reprise her Winter Olympics performance of Leonard Cohen's "Hallelujah", receiving an extended standing ovation. In 2010, she sang "You're a Mean One, Mr. Grinch" with Matthew Morrison in a Christmas episode of Glee, and is featured on Glee: The Music, The Christmas Album. In February 2013, she appeared in Season 8 of the CBS sitcom, How I Met Your Mother, as herself. In 2014, she appeared in the Season 4 finale of Portlandia as an exaggerated version of herself. Lang made her Broadway debut as the "Special Guest Star" in Broadway's After Midnight, replacing Fantasia Barrino and to be succeeded by Toni Braxton and Babyface. She appeared from February 11 to March 9, 2014. Lang, who came out as a lesbian in a June 1992 article of the LGBT news magazine The Advocate, has championed gay rights causes. She has supported many causes over the years, including HIV/AIDS care and research. Her cover of Cole Porter's "So in Love" (from the Broadway musical, Kiss Me, Kate), appears on the Red Hot + Blue compilation album and video from 1990 (a tribute to Cole Porter to benefit AIDS research and relief). Her 2010 greatest hits album, Recollection, also includes this cover of "So in Love". Lang also recorded the song "Fado Hilario", singing in Portuguese, for the 1999 Red Hot AIDS benefit album Onda Sonora: Red Hot + Lisbon, a traditional fado from Portugal. She is a vegetarian and an animal rights activist. Her "Meat Stinks" campaign in the 1990s created much controversy, particularly in her hometown, in the middle of Alberta's cattle ranching industry—she was banned from more than 30 Alberta radio stations. A sign in Consort, Alberta, stating "Home of k.d. lang" was burned to the ground. Alberta's agriculture minister at the time said it was "extremely unfortunate that she has decided to side with the animal rightists. There's a certain feeling of betrayal – we have supported k.d. fairly well in Alberta". More than a dozen radio stations in the U.S. throughout Kansas, Oklahoma, Missouri, Montana and Nebraska also boycotted playing her records due to her "Meat Stinks" campaign. Lang appeared on the cover of the August 1993 issue of Vanity Fair photographed by Herb Ritts. The cover featured Lang in a barber chair while model Cindy Crawford appeared to shave her face with a straight razor, which Lang would later say was inspired by the French film Le mari de la coiffeuse. The issue contained a detailed article about Lang which observed that she had thought that she would be ostracized by the country music industry when she came out as a lesbian. However, Nashville was accepting, and her records continued to sell. When she appeared in an ad for PETA, Nashville was less impressed, owing to the relationship between country music and cattle ranching. In April 2008, Lang spent time in Melbourne, Australia, as a guest editorialist for The Age. This was in connection with her support for the Tibet human rights issues. On April 24, 2008, she joined pro-Tibet protesters in Canberra as the Beijing 2008 Summer Olympics torch relay made its way through the Australian capital. In 2011, Lang was inducted to Q Hall of Fame Canada in recognition of the work she has done to further equality for all peoples around the world. Lang reflected on coming out in a 2016 interview with The Canadian Press, saying it "felt like it was the most responsible thing for society and myself" at the time. She also noted that dealing with the fallout was something she struggled with in the years that followed. "It's a very hard thing to unravel for me and decipher," she said. "In a way you can't. It's all just a big ball of wax of who I am and what my role in popular culture was — and what pop culture's role was in me." Lang is a member of Canadian charity Artists Against Racism. In November 2005, Lang received the National Arts Centre Award, a companion award of the Governor General's Performing Arts Awards. On June 3, 2008, it was announced that she would receive a star on Canada's Walk of Fame. In 2018 Lang was appointed to the Alberta Order of Excellence. ^ "Jane Siberry – When I Was A Boy (CD, Album) at Discogs". Discogs.com. Retrieved April 19, 2014. ^ "k.d.lang's Watershed". Shambhala Sun. Retrieved April 19, 2014. ^ Basiliere, Aaron (September 26, 2008). "Madeleine Peyroux: Half the Perfect World (2006)". All About Jazz. Retrieved July 17, 2012. ^ Starr, Victoria (1995). k.d. lang: All You Get is Me. Random House of Canada. p. 2. ISBN 0-394-22442-6. ^ "k.d. lang hits watershed moment". News24. February 6, 2008. Archived from the original on August 14, 2014. Retrieved February 16, 2010. ^ "k.d. lang: Biography". cmt.com. June 21, 2004. Retrieved June 29, 2008. ^ Sperounes, Sandra. "Hootenannies and hallelujahs: 25 years of k.d. lang". ^ Adria, Marco (1990). "A portrait of the artist as a young cowpunk: k.d. lang". Music of Our Times: Eight Canadian Singer-Songwriters. Toronto: James Lorimer & Company. pp. 139–144. ISBN 1-55028-315-4. ^ "lang, k.d. biography: Contemporary Musicians". enotes.com. Retrieved June 29, 2008. ^ a b c d e Friend, David (July 1, 2016). "Five memorable fashions from k.d. lang". Retrieved July 14, 2016. ^ Tuber, Keith (May 1992). "k.d.lang Looks Inward". Orange Coast Magazine. 8 (5): 115. Retrieved December 12, 2013. ^ "Women of the year throwback: 8 Canadians who rocked the '80s and '90s". chatelaine.com. ^ "Canadian Lesbian and Gay Archives". CLGA. CLGA. 1998. Retrieved September 27, 2016. ^ Holden, Stephen (June 21, 2004). "JVC Jazz Festival Reviews: Tai Chi Precision and Constant Shading". The New York Times. Retrieved June 29, 2008. ^ "k.d. lang – view the music artist's biography online". VH1. Retrieved June 29, 2008. ^ "K.D. Lang Eying February for Next Album". Billboard. October 10, 2007. Retrieved October 11, 2007. ^ "The second coming of k.d. lang". The Sunday Times. January 13, 2008. Archived from the original on May 17, 2011. Retrieved October 6, 2010. ^ Serpe, Gina; Rosenbaum, Claudia (January 10, 2012). "K. D. Lang Ends Domestic Partnership With Longtime Lady Love". E! Online. Archived from the original on January 10, 2012. PDF of filing. Archived from the original on January 10, 2012. ^ "k.d. lang and the Siss Boom Bang's North American Tour Dates!". 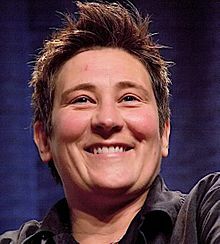 KD Lang. Retrieved December 16, 2015. ^ "Portland's own k.d. lang on her Oregon Zoo concert and moving to the Rose City". The Oregonian. June 30, 2012. Retrieved July 2, 2012. ^ Jennifer Graham (April 21, 2013). "k.d. lang's fellow musicians on her Canadian Music Hall of Fame induction: 'She deserved to be there a long time ago'". National Post, a division of Postmedia Network Inc. Retrieved November 5, 2017. ^ Joanna Adams (April 21, 2013). "k.d. lang Junos Speech: Singer Enters Canadian Music Hall Of Fame". Huffington Post Canada. Retrieved March 16, 2014. ^ "Four Sessions – k.d. lang – Homepage". BBC. Retrieved April 19, 2014. ^ "Grammy winner k.d. lang will make Broadway debut in After Midnight". Playbill. September 13, 2013. Archived from the original on February 22, 2014. Retrieved January 29, 2014. ^ "A Married Life: From k.d. lang to Chely Wright". advocate.com. May 2012. ^ YesThisIsTheYear (January 10, 2010). "KD Lang" – via YouTube. ^ Richard Harrington (July 2, 1990). "Cattle country's beef with k.d. lang". The Washington Post. Retrieved December 19, 2015. ^ "K.D. Lang's Career Takes Another Twist". afterellen.com. April 2004. Archived from the original on June 15, 2008. Retrieved June 29, 2008. ^ "Canadian Singer K.D. Lang Will Protest for Tibetans Today: Here She Tells Why". The Age. April 24, 2008. Retrieved April 26, 2008. ^ "Q Hall of Fame". ^ "Artists - Artists Against Racism". artistsagainstracism.org. ^ "k.d. lang biography". Governor General's Performing Arts Awards Foundation. Retrieved February 9, 2015. ^ "Steve Nash, k.d. lang among New Walk of Fame inductees". CTV. June 3, 2008. Retrieved November 5, 2017. ^ "k.d. lang | The Alberta Order of Excellence". www.lieutenantgovernor.ab.ca. Retrieved October 18, 2018. Wikimedia Commons has media related to k.d. lang. "Full Moon Full of Love"